Home Contests and Freebies Promos and Raffles Want to Win Computer Notebooks? Want to Win Computer Notebooks? Hungry for FREE Computer Notebooks? Then all you have to do is eat in the nearest SM Foodcourt and you will have a chance to win a BRAND NEW COMPUTER NOTEBOOK. 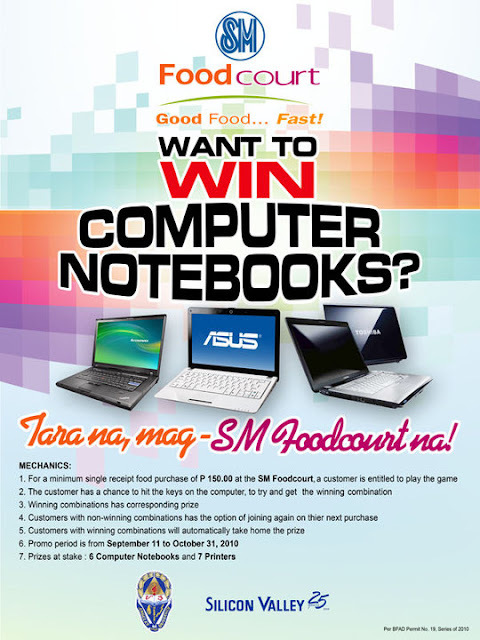 From September 11 to October 31, 2010 SM Foodcourt will give away 6 Computer Notebooks and 7 printers.